ISLAMABAD: Prime Minister Nawaz Sharif and President of the State of Palestine Mah­­moud Abbas inaugurated Palestinian embassy in Islamabad. The new Palestine Embassy Complex has been built in the Diplomatic Enclave. The government gifted land in 1992 for the purpose and in 2013 also contributed towards its construction. President Abbas thanked Pakistan for its support on constitution of the embassy and told the media he had briefed PM Nawaz about the latest situation between Palestine and Israel. “I have also informed your excellency about the dangers of moving the American embassy to Jerusalem and its effect on settlement activities,” he said. Abbas emphasised the need for a joint committee for strengthening bilateral relations and constituting a social infrastructure for peace and prosperity. He added that he had been briefed on the latest situation regarding India-held Kashmir. Abbas is on a three-day visit to Pakistan. He is accompanied by a 17-member delegation, including five ministers. 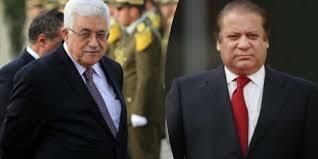 It is the third visit by President Abbas to Pakistan. He has previously been to the country in 2005 and 2013.